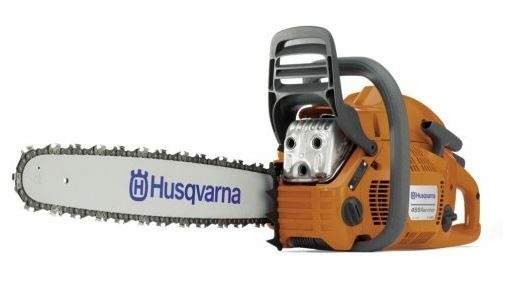 5 Best Chain Saws – Which One Should You Buy? Chainsaws can make short work of tiring and time-consuming tasks like trimming trees and shrubs. With storms more severe in every part of the US, more homeowners must handle downed trees and limbs, and a powerful saw can make fast work of a task that would take hours by hand. 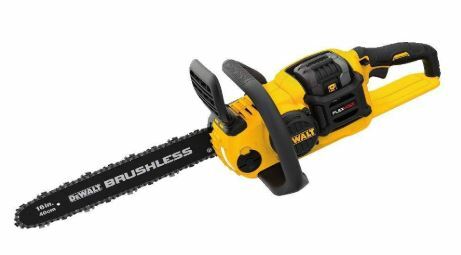 Chainsaw reviews describe how fast-moving teeth and strong blades extend the reach and fly through small to large pieces of wood. However, power style tools are sharp cutting machines, and you must respect their open blades and teeth when using them. With practice, patience and experience, it is always a helpful tool that, in some situations, is a necessity. And now, the team at BestCabinetTableSawsis going to explain exactly what to look for. It offers power, portability, and lightweight handling. You will not have to remember to go to get the special fuel or mix and store gasoline. This powerful battery-powered unit will perform like a gas-powered model and give hours of versatile performance. The comfortable grip and trigger have a convenient safety switch. The machine has a continuous oiling system to keep the sharp chain teeth moving and cutting smoothly. If you have trees nearby, use firewood, or have an occasion to gather some, then you should buy a chainsaw. This tool will pay for itself in savings for those that use it to collect and organize firewood. The next question involves finding the right model for you. Chainsaws come in a variety of sizes, power levels, and fuel types. The sizes correspond to the length of the blade bar. Typical sizes are 14 inches, 16 inches, 18 inches, and 20 inches. The fuel types include corded electric models, battery-powered models, two-stroke gas engines, and four-stroke gas engines. The size of the blade and power level indicate the kind of work the machine can handle. Longer blades can cut through thicker materials than short blade models. The power rating is in volts, amps, or horsepower; and this provides information on the cutting power. The size of the blade is important to get the larger objects you may encounter. A blade in the 18 to 20-inch range is good for medium to large branches and trunks. 14 inch to 16-inch blades would work well for light duty cutting. When selecting you should consider the size, balance, and weight of the machine and determine the range you find comfortable. Comfort should include short and longer work sessions. When you match a saw well to your needs, then you will find many uses for it. 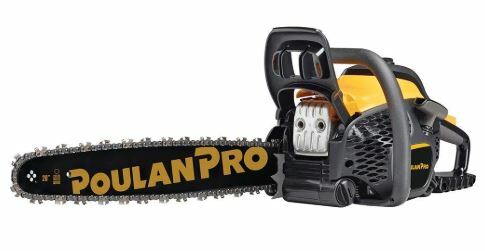 You will begin to solve problems with this tool in mind, and then you will likely be glad that you bought a good chainsaw. The DEWALT Flexvolt has a high-efficiency brushless motor. The machine runs quietly, with low vibration, and without harmful fumes from burning fuel. You will benefit from the comfortable, balanced weight design that supports comfortable use on short or long sessions. The long runtime battery provides up to 70 cuts per charge. The battery offers quick charges for minimum waiting time for a fresh charge. Power style tool users must stand close to the action of the saw on the cutting target. Whether trimming trees in the yard, gathering firewood, or cleaning up after a storm, you will be close to the impact of the blade on the wood. When using a gas-powered model, you will also be close to the spent fuel exhaust. Depending on the model, fuel mixture, and weather conditions, you will have to guard against the effects of breathing fumes. In the past that meant dealing with an under-powered corded model and wrestling with the wires. Today, you can have power, mobility, and relief from fumes; you can have the DEWALT FLEXVOLT 60V. The specifications are impressive. The motor produces a powerful blade rotation, and the self-oiling system keeps the bar and chain thoroughly lubricated. The quarter turn oil cap is convenient for quick refills. The 16-inch bar will go through large branches and whole tree trunks easily. The safety features include no emissions from operations, low noise, an anti-kickback bar, and chain brake protection. The machine is lightweight at 12.2 lbs., and it handles easily when working overhead or at awkward angles. The features include a tool-Free chain tensioning control and bar tightening knob. You can easily maintain proper bar clamping force. The Timberpro is a lightweight, compact model that has a comfortable grip and excellent balance of weight. Running a saw can tax the hands, wrists, and forearms, and the machine’s balance is important to comfortable usage. You can use this machine easily for short or long running tasks without tiring. The Timberpro has an automatic oil feeding system to keep the chain and bar fully lubricated during operations. The model offers an assisted start feature to help get going quickly in warm or cold conditions. The Timberpro will serve you well when taking on tree trunks and large tree branches. The long blade and sharp chain teeth will fly through softwood and hold up well with tough material like oak or rosewood. The blade size is excellent for a wide range of tasks. You could take down a medium to a large tree and trim it to firewood with this tool. A dense wood would not pose difficulty with the trigger throttle in raising and lowering the blade speed. The manufacturer packaged extra chain and a detailed starting instruction. Many users found the extra steps in the instructions to start were not needed in warm weather as the engine turned over easily. The safety features include a handguard in front of the handle, spikes to protect the body, and a metal front plate. The design reduces vibration, and the lightweight materials provide a strong but easy to handle package. Cutting while reaching and extending height goes easily with this 15-lb. powerhouse. The machine requires little assembly and set-up. It provides tools for refueling, adding oil, and adjusting the blade tension. 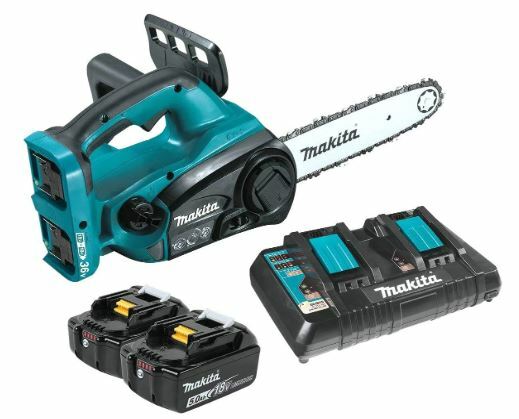 Makita has re-engineered the 18V platform to give you dynamic power and flexibility. This lightweight, easy maintenance machine will solve your wood cutting needs and avoid tool maintenance problems. The Makita 18V does not need a cord or fuel; it runs on a combination of 36V of battery power. The machine has a compact design and the weight has a forward balance. The handle grip is firm and comfortable. With no cord or fuel burning to worry about, you can focus on cutting and using the flexibility of the dynamic saw to best advantage. The powerful motor turns the chain at 1650 FPM; this high rotation speed gives fast cuts on tough wood and materials. The machine runs quietly, on the ANSI standard the sound rating is 89dB(a). The machine has dials and settings for chain adjustments that do not need tools. You can make fine changes on the fly without having to stop, find the right tool, and consult directions. The machine ships with two 18v batteries and an 18 v dual battery charger. These Lithium-Ion batteries have the shortest re-charge time in their class; these batteries will keep you ready for action. The savings from battery power are remarkable. You will not have to keep spark plugs, maintain fuel filters, and perform periodic maintenance to replace fuel and filters. You will not get unwanted exposure to emissions from gas-oil combustion. The time you spend outdoors with your battery powered model will be healthier than with gas-powered models. You will save a lot of money on fuel and the time it takes to mix it properly. For most gas-powered machines they perform best with premixed fuel which costs approximately 10x more than mixing. This all-around tool is a great choice for users of all levels of experience. Seasoned saw users will appreciate the spring assisted start mechanism that reduces the number of tries and the pull needed to turn the starter. The choke-starter mechanism prevents flooding. The Poulan Pro uses a system to increase energy efficiency. The carburetor enhances the oxygen flow and boosts the power from each engine stroke. This feature improves performance and lowers the cost of fuel. You can use premixed fuel with it and that will give consistent performance. When mixing fuel, it is vital to follow directions exactly. The mixture must have high-grade gasoline and the right balance of fuel oil. The best made saw will not perform well without adequate fuel and bar oil. The chain must be wet with oil whenever it runs. In cold weather, some oils lose proper viscosity and do not flow properly. You must carefully follow the manufacturers rating for gas-oil and chain and bar oil to get the high level of performance that you need. The machine has a compact design and forward weight balancing. You will use the machine comfortably for long tasks. The machine weighs 17 lbs., and the well-made, lightweight body will not overwork the arms and hands. The powerful cutting tool also has nice features that sim0plify operations. The adjustments for blade tension and chain oil require a tool. The Poulan Pro has a combination tool and wrench to make all of the standard adjustments. The combination tool mounts on the back of the saw so that it is always available and handy. The Husqvarna 455 is a professional quality cutting machine with the size and versatility needed to handle a wide range of tasks. It is ideal for users with moderate to heavy demands for cutting. The machine is built to be tough and durable. You can run it every day or run it heavily for intermittent periods; the machine will handle the load. The design has some important safety and operating features built-in that will keep you cutting successfully for a long period of seasonal needs. The machine requires a balanced supply of air and fuel at startup, and it has settings to relieve engine flooding by purging the starter. The pull handle start works well and reliably; it does not need a lot of exertion. Fuel storage and freshness are factors that you must consider with this or any two-stroke gas-powered engine. The fuel mixture must be precise, and the gasoline must have 89 octanes or higher. Due to variance from seller to seller, you will likely find that the best results come with factory premixed fuel. If you wish to store the machine for an extended period, it is best to follow recommendations on keeping and refreshing the fuel. Two stroke engines are sensitive to changes in the balance of fuel to air, and a stale fuel will cause reduced levels of performance. The bar and chain require constant lubrication, and this is true in warm or cold weather applications. The recommended oil stays loose and flows easily whenever you operate the machine. The design assumes that you will use Husqvarna or a similar quality grade of oil-gas and bar and chain oil. Husqvarna engineers its machines so that the fuel will run out before the bar and chain oil runs out. It is vital never to operate the machine without a supply of high-quality bar and chain oil. You can have power, convenience, flexibility all in one battery powered saw. The 36V Lithium-Ion powered motor eliminates emissions from fuel burning. You will have a more enjoyable experience using your saw outdoors without guarding against fumes. You will save time and money on maintenance, filters, and oil-gas mixtures. Your fast charge batteries will always be ready even after a long lay-off. The Timberpro is a feature-rich machine that has a price point within reach for buyers of every level of experience and with light or moderate needs. The machine will do well with frequent use, and the price and value will appeal to buyers that will not use the machine heavily. It does not require a lot of maintenance and, with fuel mixture and stabilizer standing by, the machine can be up and ready to cut within minutes even after a long lay-off.